The U.S. is currently building about 6 billion sq. ft./year and demolishing about 1 billion sq. ft. —adding about 2% and replacing about 0.3% of our building stock. We build a lot more residential than commercial. How much GHG emissions does this much construction release? 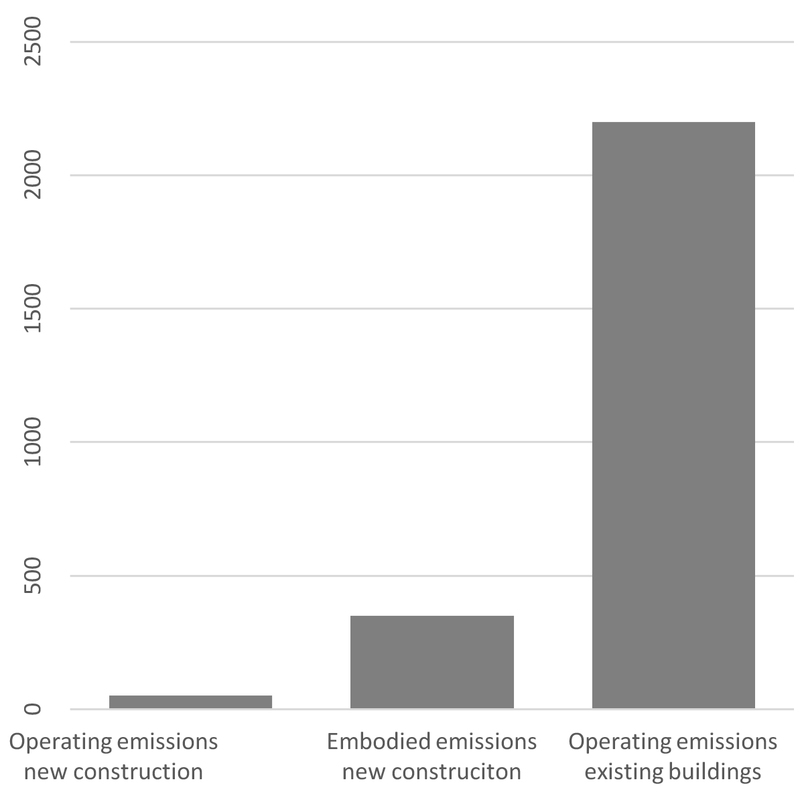 There is currently no agency or organization that tracks embodied emissions nationally, but there are a couple of ways to estimate the embodied emissions from materials and construction. The big picture, top down approach uses an Economic Input/Output Life Cycle Assessment (EIO LCA). 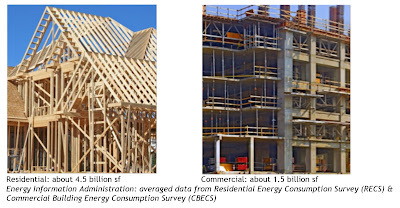 EIO LCA’s for construction assign emission factors per U.S. dollar of construction activity for different construction sectors of the economy—residential, commercial, manufacturing, and other categories of buildings. 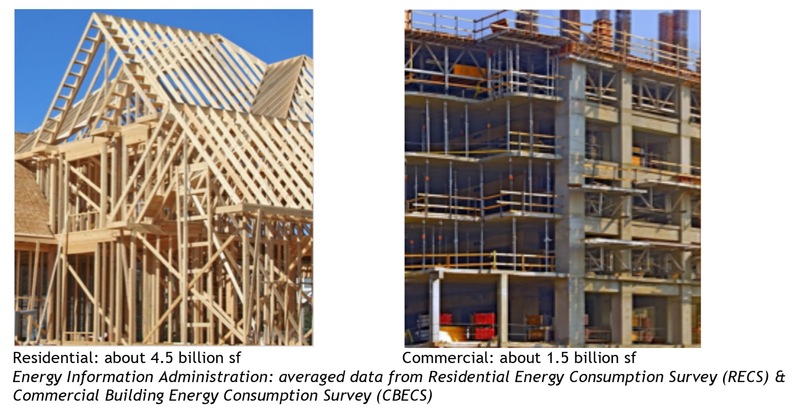 Carnegie Mellon has on-line EIO LCA models, that give emission factors for different sectors of the construction industry and McGraw Hill Construction/Dodge publishes annual construction data—square feet of construction and values of construction activity by building sector. Architecture 2030 puts annual U.S. eCO2 emissions from materials and construction at 5.9% of total U.S. emissions (based on updated EIO LCA numbers from Architecture and Energy, Richard Stein). Total U.S. emissions in 2013 were 6.3 billion tons. Figure 3. 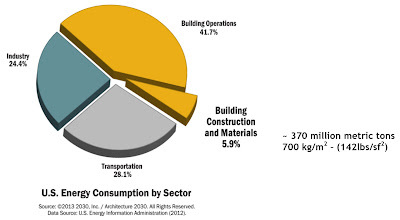 Energy Use by End User Sector (Materials and Construction separated). Note: although energy consumption and GHG emissions are roughly equivalent. The bottom up approach calculates environmental inputs and outputs (including GHG emissions) from all the materials and construction activities that go into making a building by conducting a whole building life cycle assessment (LCA). You would need do this for all the different building types and then multiply that by the total number of buildings we build each year. Whole building LCA’s are becoming more common, but the number of buildings with whole building LCA’s is still very small. Whole building LCA’s use tools such as the Athena Impact Estimator that calculate environmental inputs and outputs from area take offs, or Tally—that gathers LCA data from Building Information Modeling (BIM), using Revit software. The Carbon Leadership Forum (CLF) has taken the first step in collecting this data. They recently completed the Embodied Carbon Benchmark Project, gathering LCA data from over 1,000 building’s, and used the results to establish initial eCO2 ranges for different types of buildings. The eCO2 numbers from this study are lower than the numbers generated by EIO/LCA’s: 100 – 400kg/m2 (20–80lbs / ft2) for residential buildings and 290 - 500 kg/m2 (60–100lbs / ft2) for commercial buildings. This discrepancy may be explained by the fact that the whole building LCA’s do not capture all the embodied emissions associated with constructing a building. Building systems and equipment, some of the transport emissions, site work and infrastructure, construction equipment, and some interior materials—are typically not accounted for in many LCA’s. EIO/LCA’s on the other hand are based on whole sectors of the economy and may capture emissions beyond the boundaries of the building. For estimating annual embodied emissions at a national scale, EIO LCA’s give a big picture overview of emissions by sector, but they don’t tell us much about emissions associated with an individual building. For understanding emissions at the building level, whole building LCA’s provide a wealth of detailed emissions data for different materials and building types. This is especially useful if we want to target reductions by material or building type. As whole building LCA’s become more common, more of the data gaps will be filled in and the numbers will likely increase and get closer to the EIO/LCA numbers. REDUCING EMBODIED CARBON If we want to reduce embodied carbon it’s useful to know where it is. The chart on the right shows a breakdown for embodied carbon for a typical office building in North America. 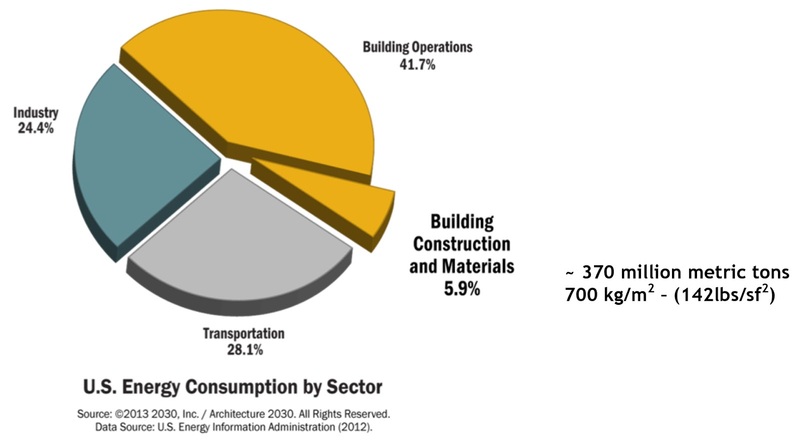 As the chart shows, most of the carbon emissions from construction come from the materials we build with. 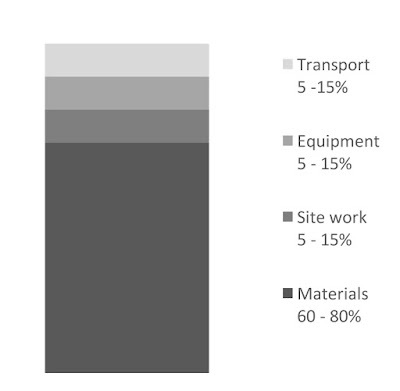 Construction equipment, transporting workers and materials to the job site and site work also contribute emissions—for remote sites transport can be significant and for large sites, site work emissions can be a larger percentage—but typically the majority is from materials. Figure 4. Where's the Carbon? of multiple embodied energy and carbon studies. It’s also useful to know the carbon footprint for different types of buildings and to understand how the materials and their carbon emissions are distributed (Figure 5). 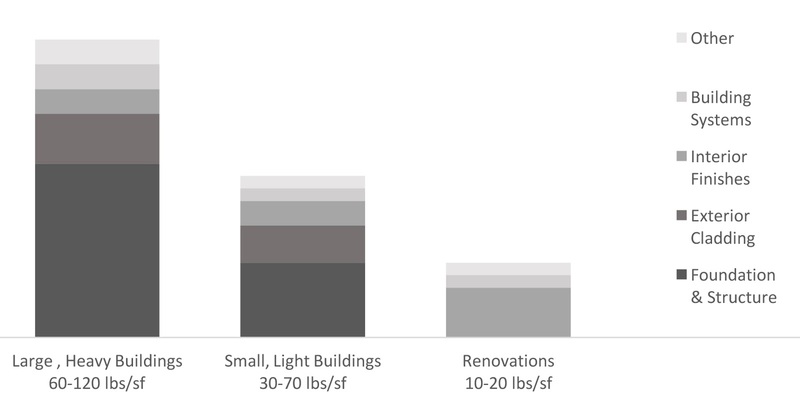 On a square foot basis, Larger heavier new buildings have a higher carbon footprint than smaller, lighter new buildings. Larger buildings weigh more per square foot because of what they are made of: beyond a certain size, buildings usually have steel or concrete structural systems, and steel and concrete have a larger carbon footprints than wood (although wood is now a viable alternative for large buildings). Small light buildings, at least in North America, have traditionally been framed in wood. It is worth noting that renovating even large, heavy buildings typically has a lower carbon footprint than building new small light buildings because you generally are not replacing the structural system which is where most of the embodied emissions are. and review of multiple embodied energy and carbon studies. Reducing embodied emissions by 20-30%, is feasible right now using readily available materials and current technologies. Reducing material quantities, particularly high volume, heavy materials such as concrete and steel, and high emission materials such as metals and plastics, is particularly effective. Ways to achieve this include designing more efficient structural systems, minimizing waste, more efficient construction processes, and minimizing energy and emission intensive materials such as aluminum and glass curtain walls. Using local, low embodied emission materials can reduce embodied carbon emissions even further. These materials are generally closer to their natural state—stone, clay, wood, straw—although when they aren’t close to the building site, transportation emissions can be a significant impact, which can reduce the efficacy of using these materials. There are also materials that sequester atmospheric carbon—plant based materials, including wood and agricultural bi-products, lock up GHG’s that would otherwise be released when the material biodegrades or is burned, and there are emerging technologies for creating cementitious binders and aggregates from CO2e captured from power plants, steel plants and other industrial smokestacks. Materials that sequester carbon theoretically can be used to create carbon neutral or even carbon negative buildings. But there is another way to reduce embodied emissions and that is to reuse existing buildings and materials rather than build new buildings. Building renovations generate significantly lower emissions than new construction, typically 50–75% less than new buildings generate. Renovation projects have lower eCO2 than new construction because they generally reuse the structure and building envelope, which account for the majority of the eCO2 in a building. But even renovation projects generate embodied emissions, and we can reduce those if we pay attention. Renovation projects often remove and replace materials such as lay-in acoustic ceilings or worn out carpet. Instead of replacing them, we may be able to use the underlying structure as the new interior finish, reducing emissions, saving money, and transforming the space in the process. We can reuse the “waste” materials that are generated by renovation projects. New construction typically generates 3–5 lbs. of waste per square foot, but renovation projects can generate 20-30 times that much. When we reuse those “waste” materials instead of discarding them, we save carbon. We can use lower carbon materials to renovate building—insulating a metal warehouse with strawbales, using salvaged materials instead of new materials or even replacing synthetic carpet with natural fiber carpets. We can also plan for future renovations, using building components that are easy to remove, clean, and refurbish. If people can change and renovate the buildings they already have more easily, they may be less likely to replace them. number. But it doesn’t begin to compare with the 2.3 billion tons of operating emissions from our existing buildings—more than a third of U.S. annual emissions. The majority of the buildings in use today will still be in use in 2030, so it is clear we need to reduce emissions from existing buildings. Siegel & Strain Architects. Powered by Blogger.